Contrast always makes things more interesting. For example, when I visited Iceland, despite a light snow, we could go swimming, because there are geothermally heated springs. At Mataranka, the contrast is crisp and bleak vs. wet and lush—and the contrast is just as striking as the cold vs. hot of Iceland. 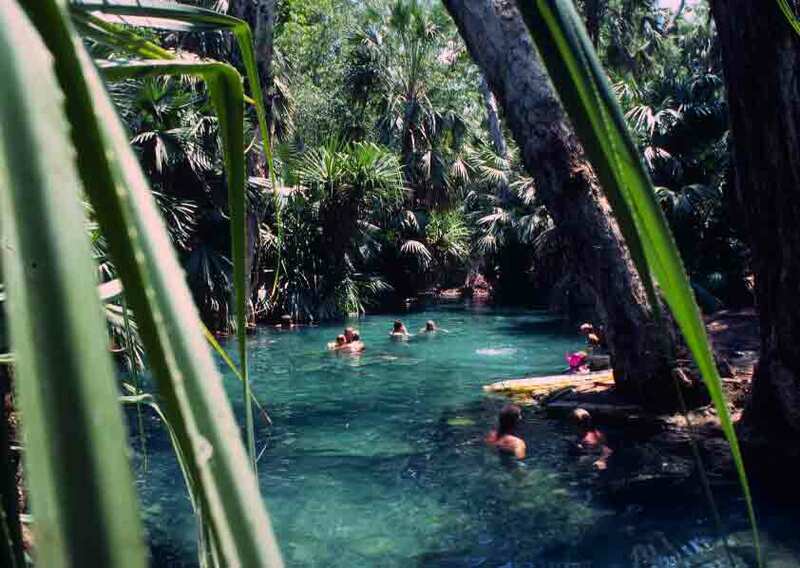 Every day, several million gallons of water flow out of the deep thermal spring at Mataranka. The clear water emerges at about 95 degrees Fahrenheit, but cools slightly as it flows through the shade of the lush vegetation the spring makes possible. 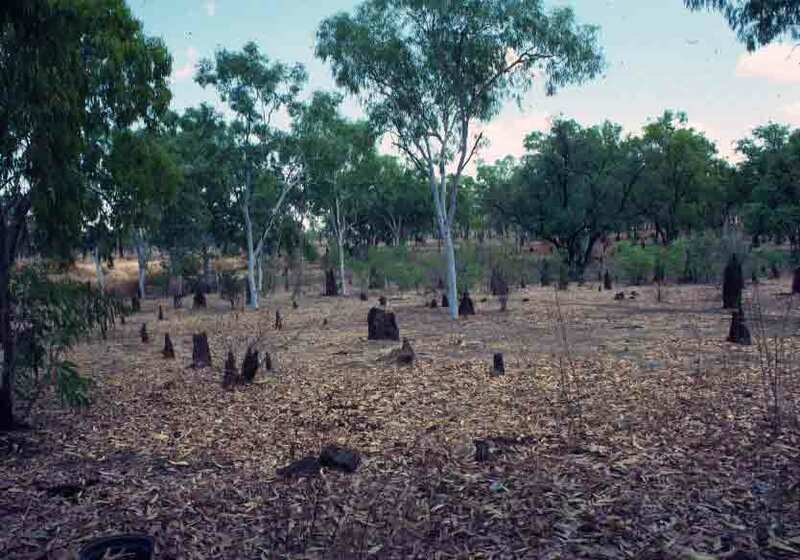 Below, the first photo is the area across which we hiked to get to the oasis at Mataranka. Not very promising. The second photo is of the pool created by the spring. The contrast is pretty astonishing—more so when you didn’t know what to expect, and just changed into a swimsuit because you were told you should. The pool is just a widening of the stream, and the water flows out at the far end, over a little waterfall. The water really is as blue and clear as it looks in the photo—and it’s wonderful to take a dip on a hot day. After Aquascene, Judy and I headed off for a brief walking tour of Darwin, before we had to catch our bus to Katherine. I acted as tour guide, having been around the town the day before. On foot, I was able to get photos of some sites I’d passed by bus previously, and among the things I photographed were the Court House and Police Station, which stand side by side. 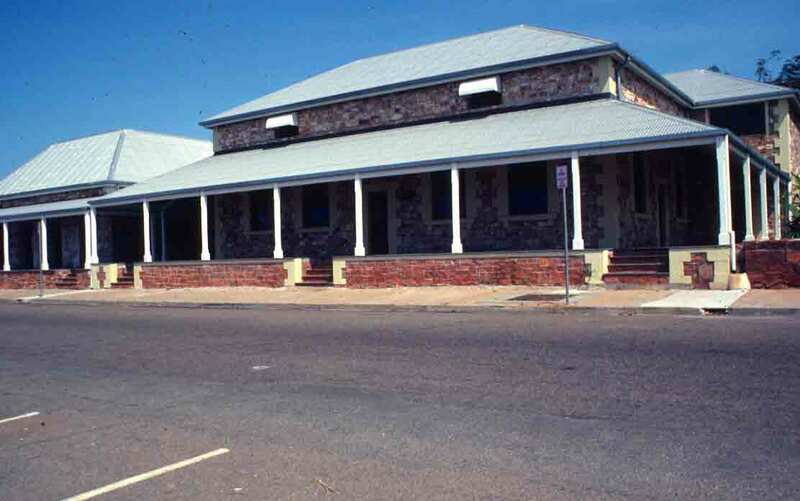 These are the stone buildings, erected in 1872, which replaced earlier buildings that had been consumed by termites. The buildings (shown below) are classic Aussie Colonial, with local rock construction, wide verandas, and steep iron roofs (the verandas and high roofs help with the heat). And then it was on the bus, and we were heading south. Pandanus is also sometimes called screw palm or screw pine (I can only imagine that the “pine” appellation came after someone saw the somewhat cone-like fruit—because pandanus itself does not look at all like pine). Traveling around the Top End, both in Kakadu and later in Darwin, I was delighted by the spiraling leaf patterns that give the screw palm its common name—most distinctly seen in the Pandanus spiralis. The leaves spiral up the trunk as the tree grows. In the wild, this leads to a leafy corkscrew. 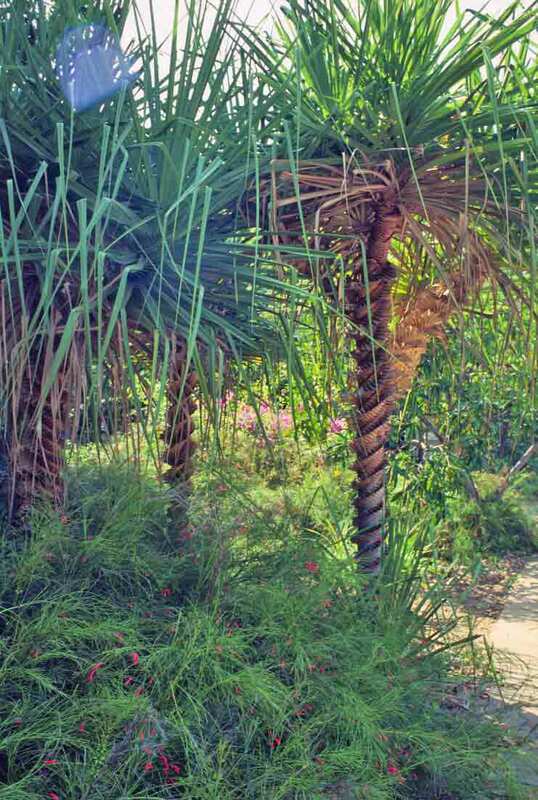 But in gardens, where the long pandanus fronds may be trimmed (as in the photo below), it is sometimes easier to discern the spiral pattern. After the adventures in Kakadu, I spent a couple of days in Darwin. One of the sights I had been told was a “must see” was Aquascene at Doctors Gully. 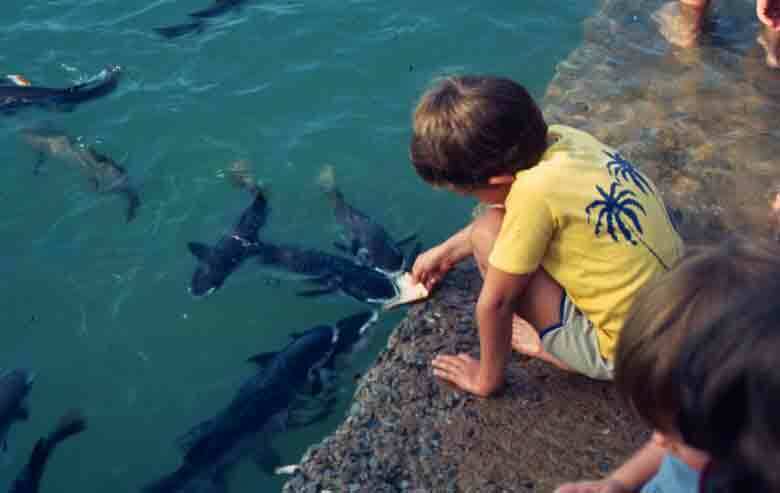 Decades ago, someone started feeding the fish at this spot, and today, at high tide, fish show up in the hundreds for free food. However, today, it’s not just one person, but rather clusters of tourists who get packs of bread with their entry fee, and get to wade out among the swirling fish. 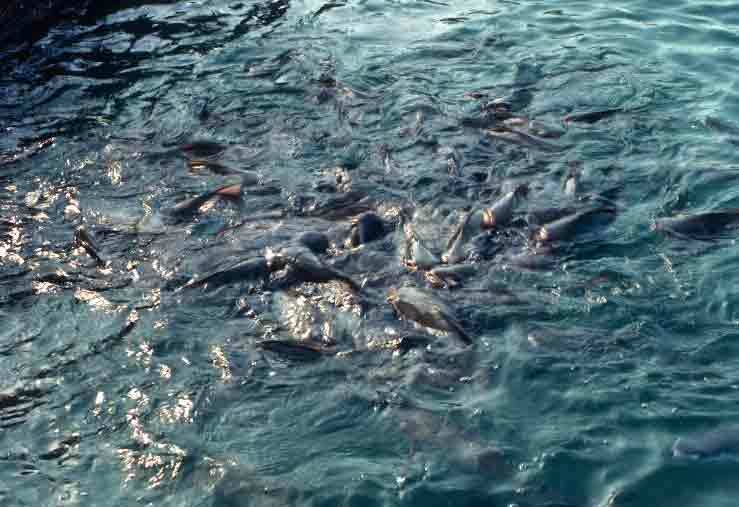 Mullet, sea bream, catfish, herring, and more crowd water as shallow as they dare, eager for the handouts. Watching little kids interact with the fish is particularly fun. The water buffalo found in the northern part of Australia are impressive and fascinating, but they are not indigenous—and they are, in fact, something of a menace. Introduced into Australia in the 1800s as work animals and as a way to supply milk and meat to settlers in remote, northern settlements, these heat-tolerant mammals from Asia went feral when settlements failed or were abandoned. 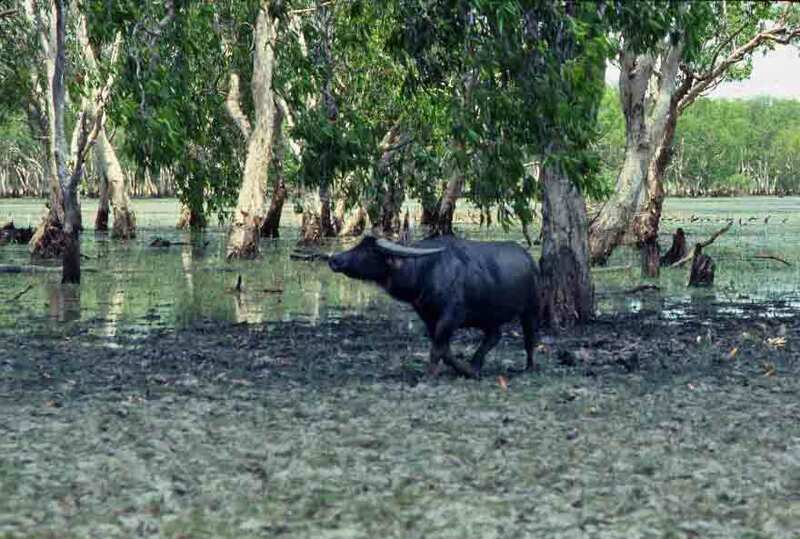 The now-wild buffalo multiplied to a point where they began to present serious problems. First, they trashed the local ecology. They trampled shorelines, destroyed bird-breeding areas, and generally demolished delicate ecosystems. Second big problem is that they carry diseases that both indigenous animals and domestic cattle could catch. So they aren’t popular. On top of that, they can be dangerous. In Crocodile Dundee, Paul Hogan’s character was able to hypnotize a massive buffalo that blocked his path, but this is not how they normally react to humans. While they might run away, they might not. They can weigh up to 3/4 of a ton, and their horns can measure ten feet from tip to tip—so if they decide to attack, you’re in trouble. And even if they just step out in front of your car as you’re driving down the road, you’re not going to survive slamming into a 1,500-pound wall of muscle. Efforts to reduce the number of feral water buffalo in the Top End have been successful, but the Australian Park Service must remain vigilant, so the numbers don’t rebound. However, though numbers are reduced, you can still see an occasional water buffalo in the wilder regions of Australia’s north.